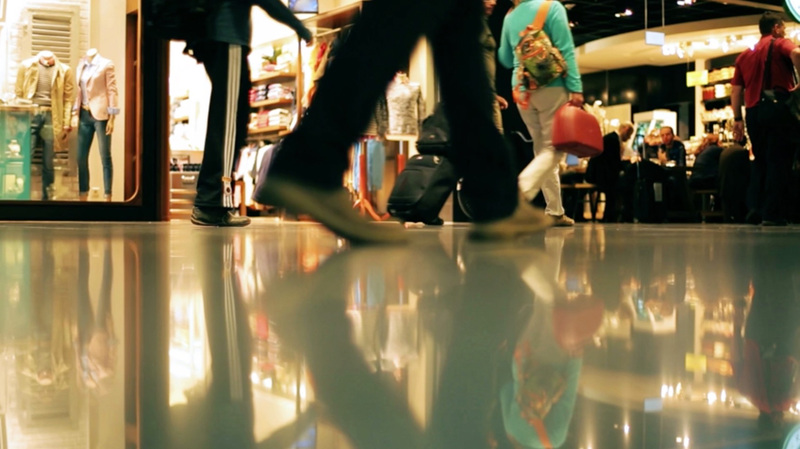 Retail Polishing Management LLC., and we are the largest decorative concrete group in the country. We are not owned by an investment firm. We are wholly owned by decorative concrete professionals. Our ownership group is 100% involved in the concrete industry every day with over a hundred years of experience in the industry. Clients with diverse local, regional, and national locations that are distributed throughout the United States (including Alaska and Hawaii), and Puerto Rico requiring a combination of union and non-union compliance. Our network of partners is designed to have 3 layers of overlapping coverage in the majority of regions. A local company subcontracting your scope of work to whoever is available outside of their region of operations, and it’s not a mega single source entity challenged with managing multiple locations with the limitations of those offices resources and personnel. Your account deserves a regional/national program with the appropriate structure of multi-level responsiveness and standardized administrative processes. Your project deserves a highly responsive local service team and the unwavering commitment of a company owner in each region. Our teams are strategically positioned to overlap one another to provide every customer and every project with the highest level of support. than any tile or coating. due to the reflective properties. No more waxing or stripping either! Can you say VALUE ENGINEERING! 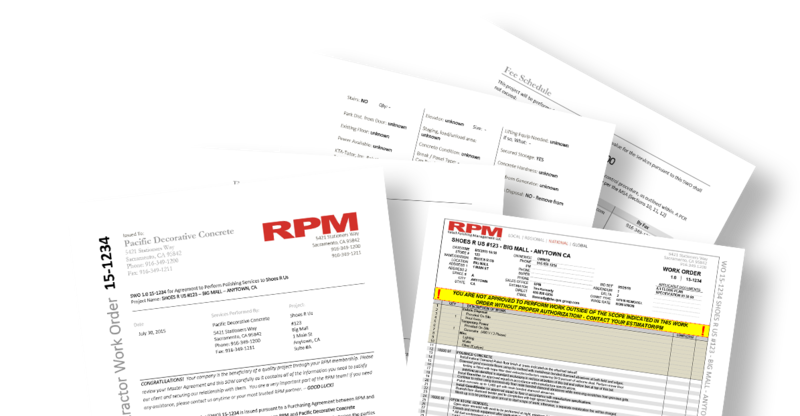 In the event that your company does not have a comprehensive specification- RPM has two options for you. We will customize our time tested and proven specification specific for your company- complimentary. Put you into direct contract with several of the leading manufactures in our industry and allow you to choose which is the best solution for your company. 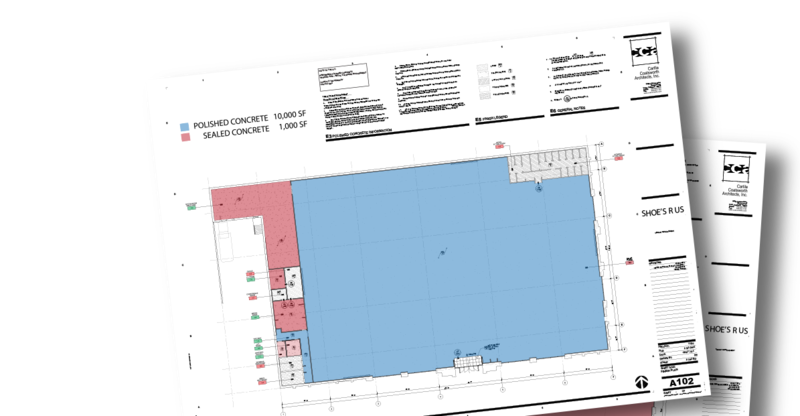 Once the specification is identified, our estimating engineers perform high quality color coded digital quantity take-off’s of your space illustrating what is included in the scope of work for your project. 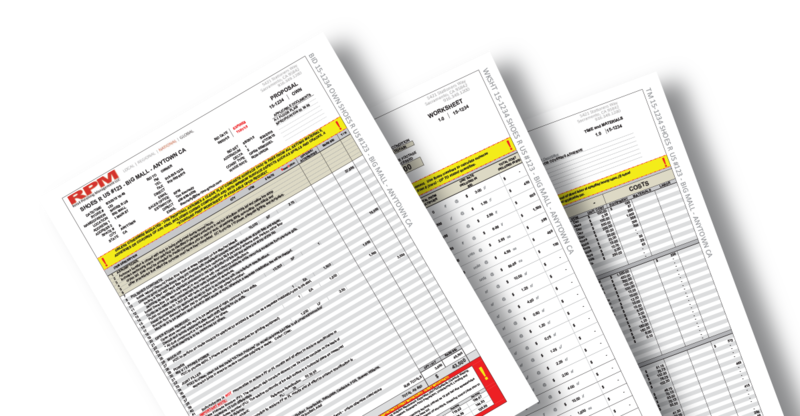 These take-off’s are provided to your team for reference and record keeping. Proposals are easy to read and clearly identify base price and options. Inclusions and exclusions are also clearly identified along with labor costs, project and contract information. 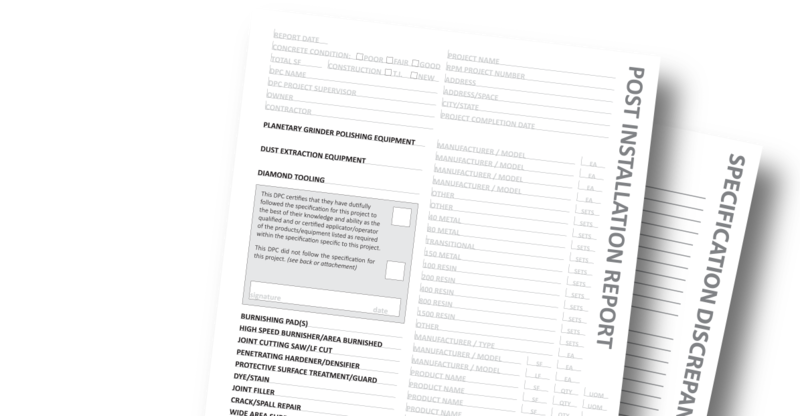 Included with your proposal package is the proposal itself, a worksheet identifying what is standard preparation work, and itemized pricing for additional scopes that may be necessary after the start of your installation. No surprises – predictable pre-negotiated pricing. Timely, Accurate, and Dependable Administration is what you can always expect from RPM administrators. They are experts in our comprehensive system and will make themselves experts in yours! 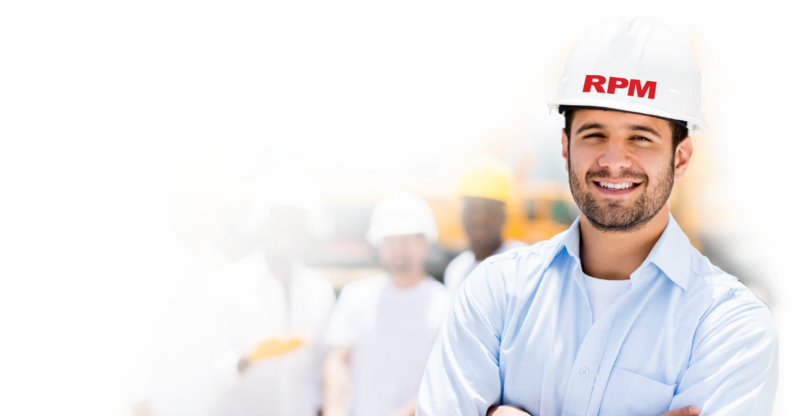 RPM Project Managers are unique and impressive group of industry professionals you can count on to be very responsive and effective. Their breadth of knowledge is unmatched anywhere! 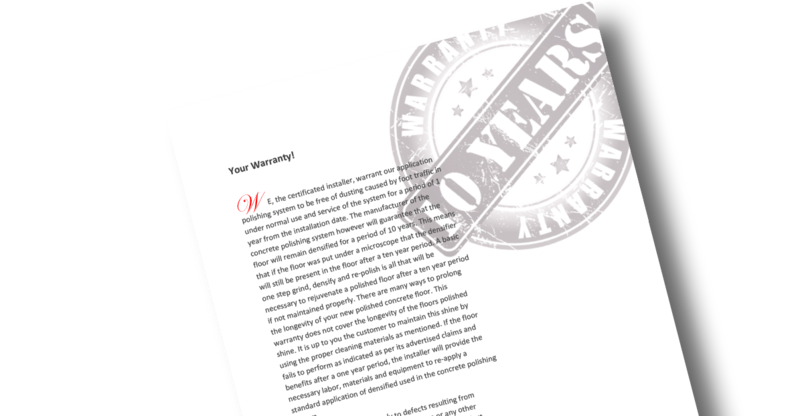 Comprehensive and informative post-installation reporting is something no one else offers in our industry. We document everything and share that information with you! 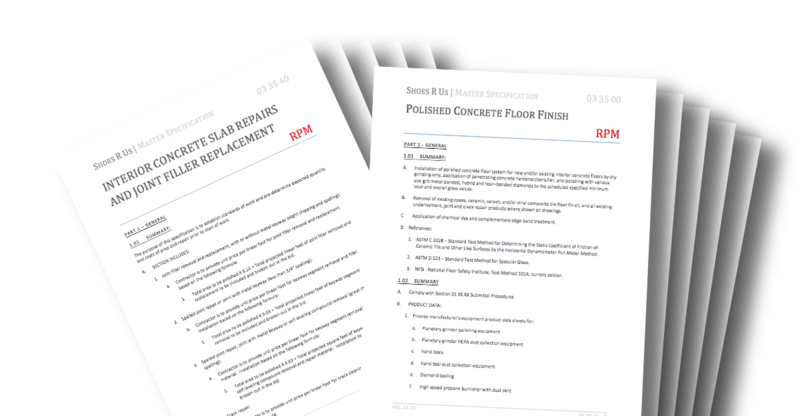 Your project close-out will be efficient and painless, standardized invoicing and an amazing extra... RPM Polished Concrete 10 YEAR WARRANTY! 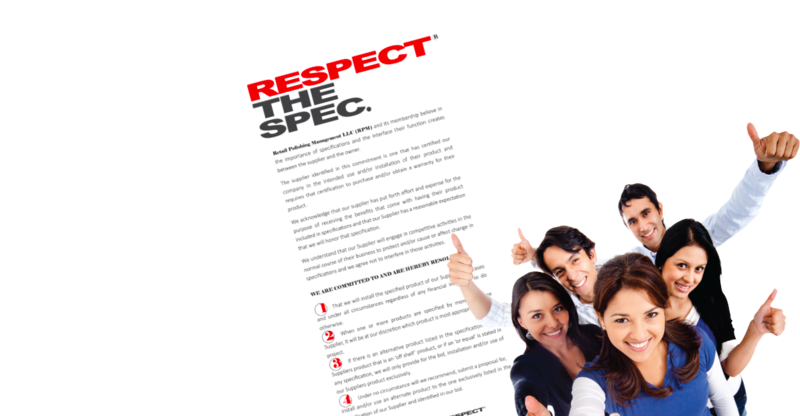 Retail Polishing Management LLC (RPM) and its membership believe in the importance of specifications and the interface their function creates between the supplier and the owner and have declared our commitment to our suppliers and your specifications. Your concrete is made of rock - it’s basically just a big flat-formed rock! We can make that rock of yours shiny. We do that mechanically with really cool equipment that grinds it, hones it, and polishes it. We use progressively different grit levels of diamond impregnated tooling and pads. AND we do that all without environmentally hazardous materials! Each of RPM’s 4 divisions covers a specific territory. This coverage may overlap in some cases in high population areas. RPM covers 98% of the US population. We can handle your projects no matter where they are located! Most RPM | DPC’s cover expanded territories where their reach if multi-state and is more overlapping with other local and regional DPC’s. RPM has you covered throughout the Continental US as well as Alaska, Hawaii and Puerto Rico! 33 locations operating out of 24 states supported by more than 300 heavy grinding platforms and a service capacity of over 100 million square feet per year. All working together to serve our customers! Shhhh… it’s our secret recipe – Call us and we can fill you in! – But don’t tell our competitors! Concrete sealers protect the concrete surface from damage, corrosion, and staining. They either block the pores in the concrete to reduce absorption of water and salts or form an impermeable layer, which prevents such materials from passing. Concrete that has been mechanically processed using progressively finer diamond impregnated tooling and pads, which then is treated with a densifier material during the process. Dyes are often applied to enhance the appearance of polished concrete as well as other features such as scoring, creating radial lines, grids, bands, borders, logos, and other designs. Stained concrete is a time tested proven beautification process for concrete surfaces. Acid stain is not a paint or coating agent, rather it’s a coloring process involving a chemical reaction on a cementitious material. A solution made with water, acid, and inorganic salts reacts with minerals already present in the concrete, and the result of this reaction is color. Epoxy coating is a flooring surface that is made up of multiple layers of epoxy that is applied to the floor to a depth of at least two millimeters. An epoxy floor must be at least two millimeters thick otherwise it is simply an epoxy floor coating. Epoxy in this case refers to a system that is made up of two main components – resins and hardeners. Resins and hardeners are mixed together where they chemically react to form a rigid plastic material that is strong, resistant to degradation, and bonds extremely well to its substrate. Overlayment is a thin cementitious topping material that adheres to the existing concrete providing a new surface. Unlike conventional cement and concrete mixes, cementitious overlays can be applied as thin as 3/8” or as thick as 2” with 24 hour cures and a very low risk of delamination. The products are ready for traffic or polishing faster than any other repair option. Surface Preparation is an extremely important part of any decorative concrete solution. Whether it is removing existing coatings or other impurities, or if it's for the purpose of leveling and/ or profiling the substrate to apply other materials such as epoxy coatings or overlayment, surface prep done correctly ensure proper bonding to your concrete substrate.